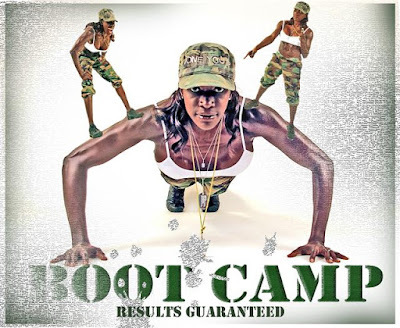 Fitness boot camps are a phenomenon. Health clubs have pre-programmed machines with built-in heart monitors, yet old-school options like flipping tires or squat-thrusting at 6 AM has impacted our fitness-frenzied culture like a medicine ball slammed on a mat-another boot camp staple. For 20 years, Guy Perreault was Master Trainer of the First 179th FA Battalion of the US Army, responsible for the fitness of 400 soldiers. He brought the same techniques--straight from the Army's Physical Fitness Field Manual-to Seacoast Boot Camp, which he launched in 2006 in Portsmouth, NH. His philosophy, "Hit it hard, hit it fast, be intense-make every workout count." Perreault's program runs six weeks with four 45-minute sessions per week. "Enlistees" run, lift, do calisthenics, and use isometrics and offbeat exercises (e.g. swinging kettle bell weights) to work each muscle group, simultaneously building endurance. Repetitions without rest raise metabolism, which burns calories long after each workout. TpxMuscle: What makes fitness boot camps so popular? G.P. It's the toughness, the intensity. When you leave here, you feel like you've done something; it's 7:30 in the morning and you've done more of a workout than you've probably ever done before. TpxMuscle: Why does this stuff work? G.P. When you're working out, and you're hitting it hard for 45 minutes, running, using heavy weights, staying, that's going to increase your metabolism. You'll burn several hundred calories during you workout, and, more importantly, continue to burn them for the next 12 to 48 hours. TpxMuscle: Do you see a similar cohesion in your fitness boot camps that you saw in the Army? G.P. I really do. In the military, you get to know people a lot better because you're with them longer. But what I find in fitness boot camp is that everybody works out with everybody, they get to know one another, and no one wants to fail. They want to pass; they want to complete the workout and the course, and they want you to complete it, too. TpxMuscle: What's the biggest misconception people have about boot camp? G.P. A big misconception is that one must be in shape to attend, but you can come to boot camp at any fitness level. Another problem is unrealistic expectations. There's so much bad information out there, diets, infomercials, videos. People think they're going to look great in two weeks. TpxMuscle: Do you think there's an information and gadget glut that distracts people from consistent exercise? G.P. Even for me! The fitness community gets smarter all the time. I'll start reading or looking at something, get caught up and think, maybe that will be really good! But then I stop and say, think about what we're doing here. Often we get hung up on terminology and stop there. Someone will say, "I belong to a gym." I'll say that's great, but a gym is a building, a location. What matters is what you do when you work out. TpxMuscle: Have you changed your program at all? G.P. That's a challenge. I do a lot of tinkering with it. If I just ran a six-week program with new people all the time, I could use the same program, but I have so many repeats that I have to keep changing it. The program is always evolving, but we're still sticking with the basics, the manual, but what I change is the parameters such as time, how much running, what circuits I'll use. TpxMuscle: Are you surprised by how many repeat customers you have? G.P. Not anymore, but at first, yes. I just figured people wouldn't stay and stay and stay. I asked myself what keeps them coming back? I'm sure it's the intensity.